Bottom line, if you’re in the business of financing a renewable fuels project with a loan guarantee in the mix, you’re probably talking with some combination of New Energy Risk, Stern Brothers, Faegre Baker Daniels partner John Kirkwood or Kilpatrick Townsend partner Mark Riedy. They’ve been part of the go-to team for more projects than there are stars in the heavens — more importantly, the ones that get done, and done well. 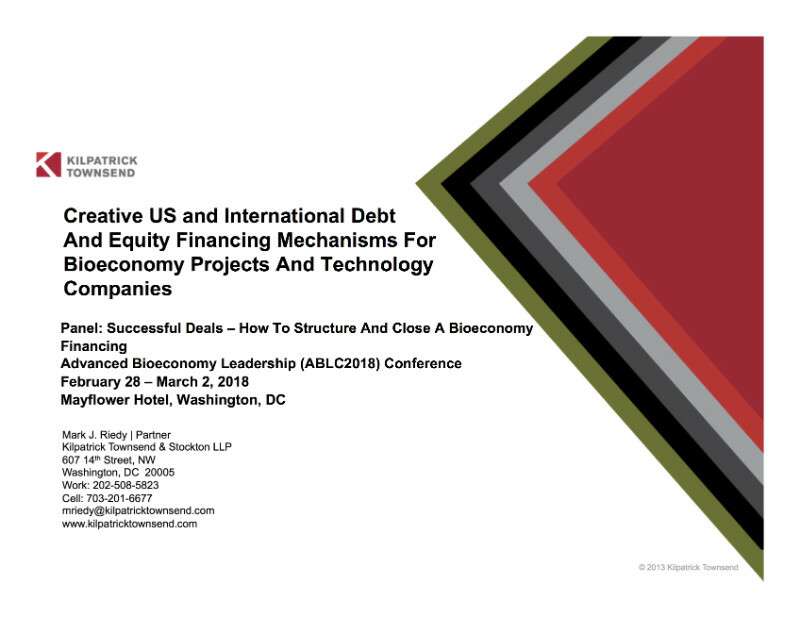 Recently, Mark Riedy gave another monumental presentation at ABLC 2018 in Washington, outlining a number of case studies in companies funding bioeconomy project in the US vs. internationally — of which this is the third part, on creative US and international debt mechanisms. Consider it a definitive must-read.